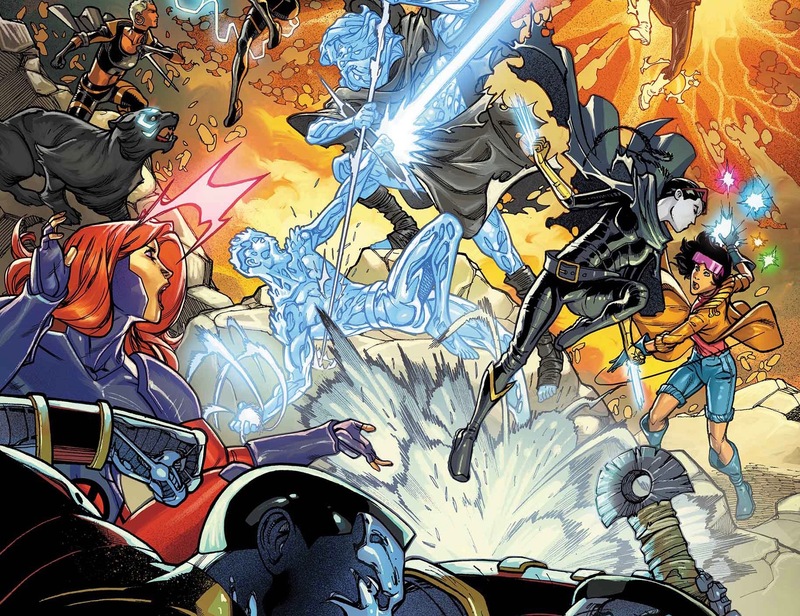 Return of the Ice Master: Sina Grace on what fans can expect from Uncanny X-Men: Winter's End #1 – AiPT! Writer Sina Grace discusses Uncanny X-Men: Winter’s End, on sale February 2019. While Marvel Comics’ current Iceman series comes to a close in January 2019, Bobby Drake fans can rest easy knowing writer Sina Grace and artist Nathan Stockman have at least one more story to tell–one month later! In February 2019, the creative team will bring Iceman face-to-icy face with a future version of himself in Uncanny X-Men: Winter’s End #1. In an Uncanny X-Month eXclusive interview, AiPT! had a chance to talk to Grace about what awaits Iceman in Winter’s End. AiPT! : How did the idea for Uncanny X-Men: Winter’s End come about? Sina Grace: The idea to do the Winter’s End special stemmed from having one last beat to explore in the Iceman series, but only two pages of the arc to devote to it. I kept trying to write a pretty important scene in Iceman’s arc, and realized I needed way more space. After chatting with editor Darren Shan for a bit, we found an angle that spoke to the entire X-Men mythology, one that really brings things together in the Iceman series as, like, a perfect end to the entire run. If you think about how the first issue of the series showed Bobby Drake sparring with a time-displaced version of his past self, it’s only fitting to have it end with him fighting with a version of himself from the future–on his birthday! AiPT! : We’ve met a few future and alternate versions of Iceman before. Is the older Bobby we meet in Winter’s End a version of Iceman we’ve met before or an entirely new take? Grace: The idea is that the Bobby our Iceman met in “Battle of the Atom” has returned from his future to warn his younger self of dark times to come. He’s aged even more since they last met, and the world has seemingly fallen into a scarier spot than ever before. AiPT! : What can readers look forward to seeing in Winter’s End that they won’t find in the current Iceman solo series? Grace: In Winter’s End, readers get to see more of the future that the Ice Master from “Battle of the Atom” is from. I also had a lot of fun playing around with character interactions outside of Bobby. We get to see some clutch moments with Kitty Pryde, Archangel, Jean Grey, and a few other surprise guests. There are so many fun character pairings that occur amidst some truly necessary dramatic convos. AiPT! : Bobby’s interactions with his younger self helped him to confront long hidden aspects of his personality and sexuality. Will this meeting with a future Bobby turn up other, previously unseen territory? Grace: The biggest bad of my series was apathy… our hero never struggled with it, so I had a lot of fun exploring what would happen if Bobby looked in the mirror and saw the worst version of himself. In so many ways, time-displaced Iceman helped our hero step up and take control of his life. Bleak vibes aside, Ice Master definitely has a few new tricks to show our hero. That’ll be exciting to have readers watch two omega-level Icemans fight. Oh, and yes… there’s a confrontation to be had on an emotional level, but readers won’t see it coming ’til it happens. Lookit how much better I got at teasing reveals! AiPT! : What was your design process like for this older version of Bobby? What other characters or versions of the character did you find influential? Grace: Nate Stockman had already played in this future timeline before with the Doctor Strange and the Sorcerers Supreme series from a couple years back, so we’ll be building off some of the cast in that arc as well as the “Battle of the Atom” arc. This will be an entirely new yarn in that era, though. I wish I had space to bring Dazzler back from the dead in that future and assume her rightful position as President! Haha. For reasons that actually harken back to the very first issues in Uncanny X-Men, we’ll also get to see our entire cast in their Mod finest. AiPT! : What facets of Iceman would you say stay consistent across his various selves? How do these traits speak to the heart of the character? Grace: The messed up thing about this story is that the Ice Master who returns from the future seemingly lacks every trait that we know about Bobby’s core. There’s no humor, there’s no levity, there’s no hope in this man. What happened to make him practically Old Man Bobby?! Only one way to find out, true believers! AiPT! : Is it safe to assume that through the Ice Master, we’ll get a sense of the fates of some of his fellow X-Men? Grace: True to the best X-Men stories around, the fates of some fan-favorites are definitely in jeopardy. I don’t show, like, every character… but a few fan-favorites make an appearance in the future storyline. That’s really all I can say. Uncanny X-Men: Winter’s End #1 goes on sale February 2019. Red Hood: Outlaw #28 review: Action. Just lots of action. Why? Who knows.